Bryce Sutherland at Markinch Library. 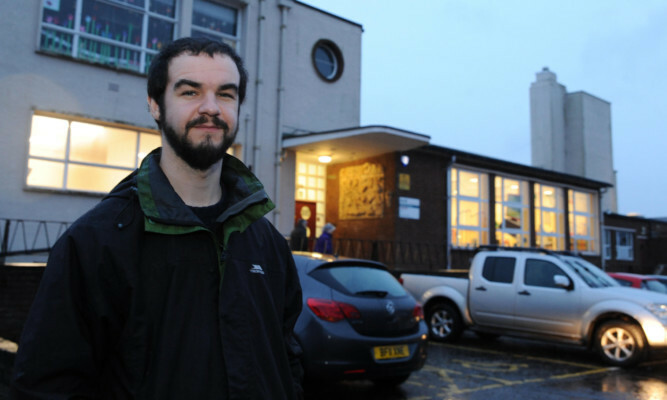 Devastated campaigners may launch a legal bid to overturn a decision to close 16 Fife libraries. As one of the UK’s top authors, Val McDermid, branded Fife Council’s controversial move a “sad and shaming day” for the kingdom, protesters revealed they had contacted a lawyer to see if a legal challenge is possible. Mr Sutherland, from Markinch, was one of several campaigners who protested outside Fife House on Tuesday in a last-ditch attempt to save the libraries. Despite a consultation, a petition and a letter-writing campaign, members of the council’s Labour-led executive committee voted by 11 votes to eight to accept Fife Cultural Trust’s (FCT) proposal to close the facilities. The trust which runs 47 of Fife’s 51 libraries on behalf of the council is facing a 20% budget cut and said closing the libraries would account for £571,000 of the £813,000 it must find in savings by April 2018. Council leader David Ross said a number of measures would be taken to mitigate the effects of the closures, including moving public-access PCs into other buildings and exploring the viability of community-run libraries. This has failed to appease campaigners, however, with Mr Sutherland claiming the consultation was a tick-box exercise. He said: “Most disturbingly, despite all the controversy surrounding the proposals, FCT were again asked if they were given the funding to keep the libraries open, would they do so? They still said no. That, coupled with there being no plan B, shows just how fraudulent the consultation process was. The council’s SNP leader, Brian Goodall, was outvoted when he proposed giving the trust £571,000 so the decision could be deferred for a year to allow communities to come up with viable alternative solutions. He pledged to fight on with each of the affected communities.